Outlet Type Available 2 x Full flow, 3 piece, 2" Ball valve with PTFE seals, part F camlock and cap. FC 304 Stainless Steel UN approved IBC (1000Ltr). Heavy duty 304 Stainless Steel construction tanks shell, 304 stainless steel pallet base and top frame, designed for the most demanding environments. Forklift truck and pallet truck and top lift. The dimensions of H1800mm x L1200mm x W1200mm. Self stacking, no need for racking. The FC Stainless Steel UN IBC is a very competitively priced rental option foir the transport and storage of UN packaging group 2 and 3 Products. The FC has a capacity of over 1050 litres, is built to last and has unrivalled strength in this class of product. Easy to fill using the large 460mm dia manway, or utilise the 1 x 2" part F camlock on the tank top. Fully drainable base. The outlet terminates in a Full flow, 3 piece, 2" Ball valve with PTFE seals, part F camlock and cap. All seals are PTFE and all wetted areas are 304 Stainless Steel. Metano employs the latest Ultra High Water Jetting technology and Industrial Robotics to clean the IBC after use. All containers are stripped, cleaned, rebuilt and tested on site at our Rowlands Gill facility. 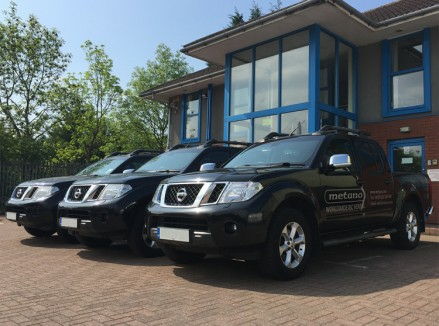 Our service centre Cleans, Repairs and performs UN periodic testing of Metano rental units.